Who should not take OXYCODONE HCL-IBUPROFEN? What conditions does OXYCODONE HCL-IBUPROFEN treat? Tell your doctor right away if you have any serious side effects, including: dizziness upon standing, swelling of the hands or feet, sudden or unexplained weight gain, fast/pounding heartbeat, persistent/severe headache, mental/mood changes, difficult/painful swallowing, signs of kidney problems (such as change in the amount of urine), easy bruising/bleeding, signs of infection (such as fever, persistent sore throat), severe stomach/abdominal pain, ringing in the ears, unexplained stiff neck, signs of your adrenal glands not working well (such as loss of appetite, unusual tiredness, weight loss). Get medical help right away if you have any very serious side effects, including: slow/irregular/shallow breathing, fainting, seizures, severe drowsiness/difficulty waking up. This drug may rarely cause serious (possibly fatal) liver disease. Get medical help right away if you have any symptoms of liver damage, including: yellowing eyes/skin, dark urine, persistent nausea/vomiting. List OXYCODONE HCL-IBUPROFEN side effects by likelihood and severity. Before using this medication, tell your doctor or pharmacist your medical history, especially of: intestinal/bowel disorders (such as paralytic ileus, infectious diarrhea, colitis, blockage), recent heart bypass surgery (CABG), liver disease, bleeding/blood-clotting disorders (such as hemophilia, vitamin K deficiency, low platelet count), stomach/intestine/esophagus problems (such as bleeding, ulcers, recurring heartburn), diabetes, gout, lung diseases (such as asthma, chronic obstructive pulmonary disease-COPD), breathing problems (such as slow/shallow breathing, sleep apnea), growths in the nose (nasal polyps), a certain spinal problem (kyphoscoliosis), certain heart problems (such as low blood pressure, irregular heartbeat), personal or family history of a substance use disorder (such as overuse of or addiction to drugs/alcohol), brain disorders (such as seizures, head injury, tumor, increased intracranial pressure), underactive thyroid (hypothyroidism), difficulty urinating (for example, due to enlarged prostate or narrowed urethra), disease of the pancreas (such as pancreatitis), mental/mood disorders (such as toxic psychosis), gallbladder disease, adrenal gland problem (such as Addison's disease), certain enzyme deficiencies (pyruvate kinase or G6PD deficiency). What should I know regarding pregnancy, nursing and administering OXYCODONE HCL-IBUPROFEN to children or the elderly? Some of the products that may interact with this drug include: aliskiren, ACE inhibitors (such as captopril, lisinopril), angiotensin II receptor blockers (such as losartan, valsartan), certain cancer drugs (mercaptopurine, methotrexate, pemetrexed), cidofovir, cimetidine, corticosteroids (such as prednisone), desmopressin, lithium, mifepristone, certain pain medications (mixed opioid agonist-antagonists such as pentazocine, nalbuphine, butorphanol), naltrexone. Does OXYCODONE HCL-IBUPROFEN interact with other medications? Should I avoid certain foods while taking OXYCODONE HCL-IBUPROFEN? If you take this medication regularly and you miss a dose, take it as soon as you remember. If it is near the time of the next dose, skip the missed dose and resume your usual dosing schedule. Do not double the dose to catch up. 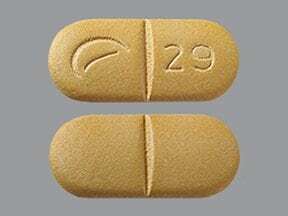 This medicine is a yellow, oblong, scored, film-coated, tablet imprinted with "logo and 29". Are you taking OXYCODONE HCL-IBUPROFEN? Are you considering switching to OXYCODONE HCL-IBUPROFEN? How long have you been taking OXYCODONE HCL-IBUPROFEN?